DCloud Backup for Office 365. When you select DCloud Backup for Servers your business information is stored within an environmentally controlled and secure location providing you with peace of mind. DCloud Backup for Servers can be configured to fit your needs whether your servers are within our DCloud environment or at your premises. 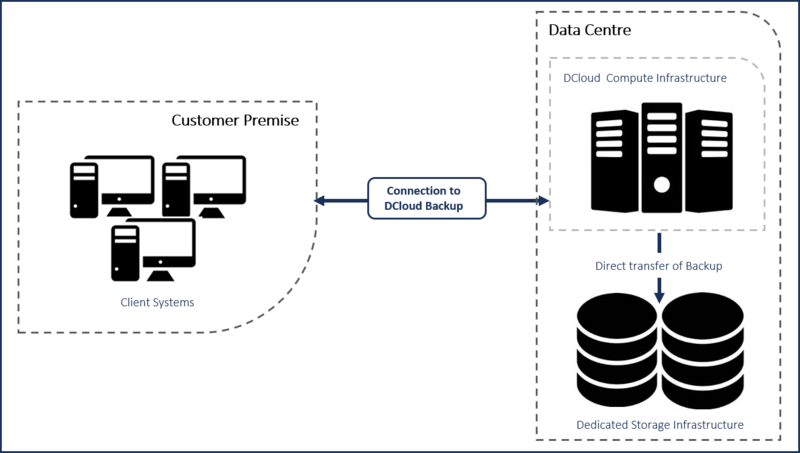 For customers using DCloud Compute (as pictured below) the backup occurs directly from our servers to the dedicated storage infrastructure. To give you excellent access to information we hold three months’ worth of retention with multiple snapshots per day. Should you realise a file was corrupted or accidently deleted during that time we can restore the information to the desired version. For customers using servers located at their own premises (as pictured below) we recommend including a local repository (NAS, DAS etc). This provides fast, local access to your primary backup should data be accidently deleted or corrupted. The duration of your retention policy will be based on your needs and the capacity of the repository. The local data is synchronised out of business hours over the internet to our dedicated storage infrastructure at the data centre. The process is completely automatic and requires no intervention from you or your staff. 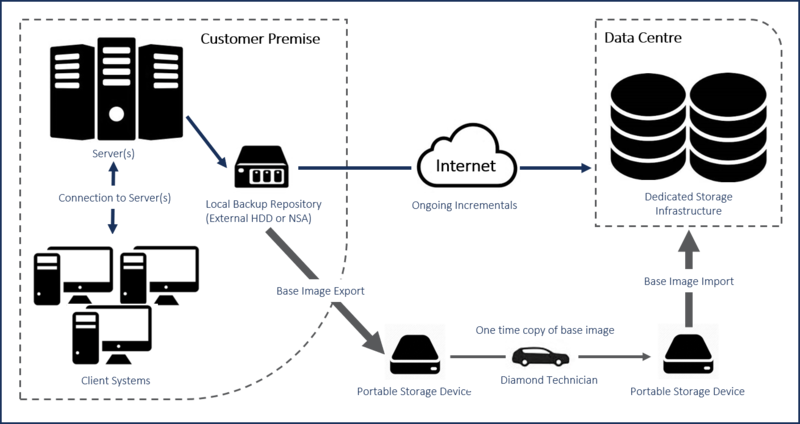 To avoid a major data transfer over the internet, Diamond takes a full backup of your server(s), referred to as the “base image” onto a portable disk which is physically transported to the data centre. The DCloud Backup solution then sends only incremental changes over the internet using advanced data compression and de-duplication technologies, the backup is readily transferred over most Internet links, including ADSL. Since its inception, Office 365 (O365) has become one of the most popular product suites in the world. Unfortunately, it’s not well known that O365 does not provide retention meaning that you have no access to previous versions of files should you need to retrieve a version due to corruption or other reasons. However, the system does allow you to retrieve deleted files for up to 30 days. We can extend and enhance the protection of your Office 365 solution by providing unlimited backup and archive retention of Exchange Online, SharePoint Online and OneDrive for Business. This powerful solution combines both Data Protection and Data Recovery. Complete Data Protection – to ensure no data is ever lost or unrecoverable. Easy to set up with nothing to install. Up to 6 snapshots daily. Rapid Data Recovery – to find lost data and restore it right back where it was. 1-click restore right back where is was without any cost, stress, expertise or time-consuming processes. 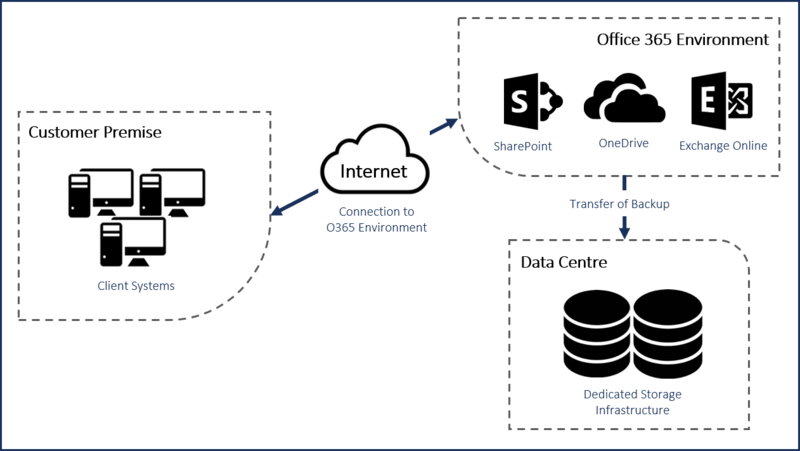 Diamond Cloud backup provides innovative and robust solutions for both your Servers and Office 365 environments. With backup solutions evolving at a rapid rate, it is important to select a provider that can help you get the most out of today’s technologies. Your business information is one of your most important assets and it’s critical to be able to restore your information from backups quickly when required. With over 10 years’ experience implementing backup solutions, Diamond’s vast knowledge in this changing landscape is second to none. We will keep your business running smoothly and securely allowing you to focus on your customers and the growth of your organisation.